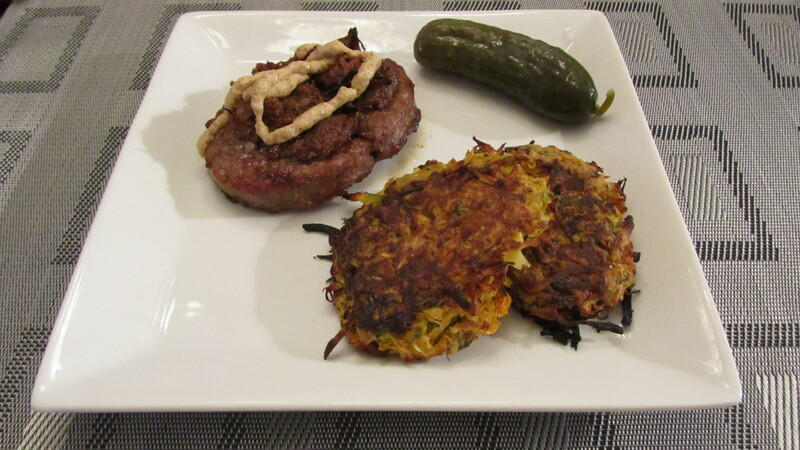 Served with a bison burger and "Bubbies" pickle. It is rare that I post a Veggie only recipe which is odd because I love to get creative with my veggies. Whole Foods has a pre-made root veggie cake that looks amazing (and apparently tastes pretty good too based on FPH’s feedback), but contains some questionable ingredients so I’ve never touched them. I decided to try making my own version. This one is definitely going into my book of favourites…..I am addicted to these suckers now. You can use any root veggies, but I like the celery root because it’s not as starchy as some of the other root veggies and it pairs nicely with the carrots and parsley. *Note: This recipe requires a food processor. If you do not have one, I am sure you could grate the veggies if you’re up for an arm workout. Hey, maybe you could sub this in favour of your shake weight routine. 1. Grate all the root veggies and onion in the food processor. 2. Mix them together with the parsley and salt/pepper in a bowl. 3. Add the egg yolks…start with 2 and then add a 3rd if needed. You should be able to mould the mixture into patties and if it is not sticking together, add another egg. 4. In a large skillet, heat the coconut oil. Also, heat your oven to 375. 5. While the pan is heating, make patties with the root veggie mixture. Squeeze out the excess moisture while you are shaping them. 6. Fry them in the skillet for about 2 minutes per side, until they are brown. 7. Transfer them onto a parchment paper lined baking sheet and pop them in the oven for about 10-15 minutes. This helps to finish cooking the veggie all the way through. Fully Primal Husband gave the following testimonial, “These are really good! They taste better than the Whole Foods patties.” Nice. Winter is a great time of year to make one-pot meals with plenty of leftovers. This stew is absolutely delicious and I’m so happy with the way it turned out. 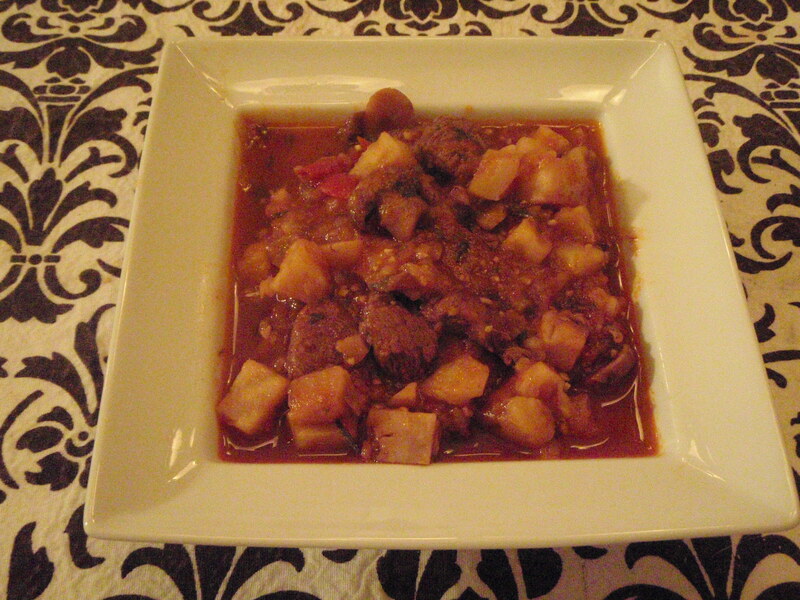 I used celery root as the primary vegetable – it is a great paleo substitute for potatoes because it has the same texture when cooked and it takes on the taste of the stew. Celery Root has a very low GI and no sugar content. – 1 14oz can cherry tomatoes – the one’s with only tomato as the ingredient. I like Mara’s. – 1/2 Cup red wine – I like to use a Merlot or Cabernet. You could omit the wine if you want to keep it 100% primal. Add chicken stock and wine. Simmer at Medium-Low heat for about 2 hours – stir every 15-30 minutes. 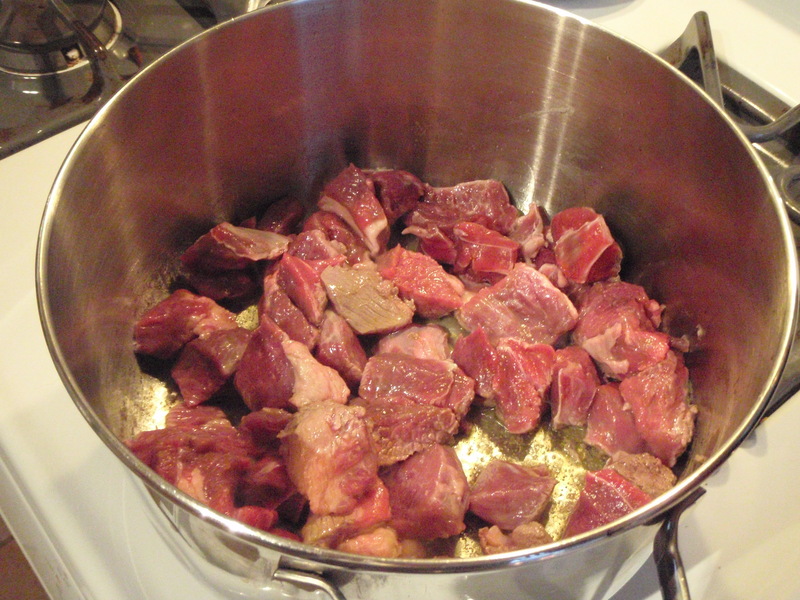 Stir the stew and try to find (and remove) the stems from the bay leaves and sprigs of rosemary and thyme. Or warn the people eating the stew that they might find a stem. To avoid this, put the rosemary, thyme and bay leaves into a piece of cheesecloth and tie it with some twine. Cook the stew with the herbs in the cheesecloth and remove cheesecloth before serving. I can never figure out where they put cheesecloth at the grocery store so I never remember to buy it. My Semi-Primal Husband provided the following testimonial: “I love the veal with the tomato base. 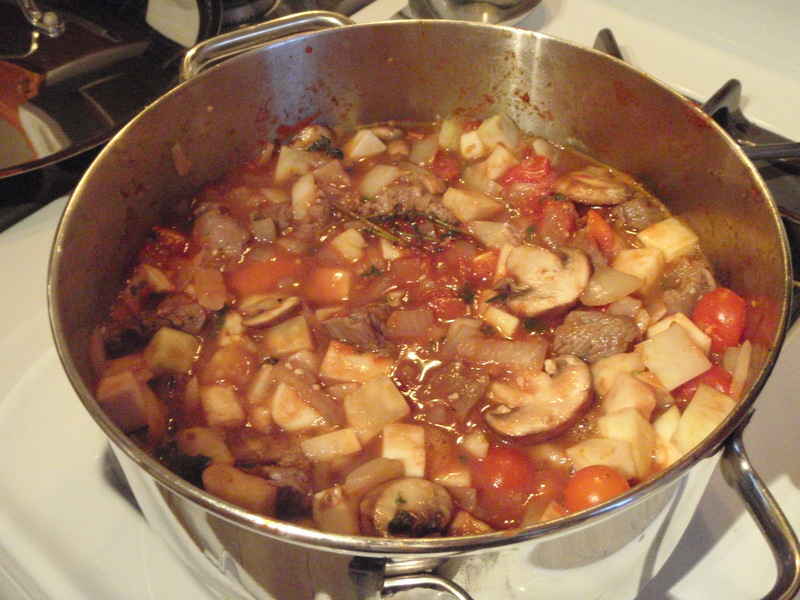 This is a really good stew.” I proclaimed that this was probably one of my better creations and he agreed. Chicken, pork, turkey, beef, fish….repeat. Eating Paleo or Paleo/Zone means eating alot of meat and it can get a bit redundant to keep eating the same meats. Shopping at local butcher shops that specialize in local and organic meats can open your eyes to a whole other world of meats. This weekend I decided to pick up a Bison Roast from the Healthy Butcher. Bison is a highly nutrient dense food because of the proportion of protein, fat, mineral, and fatty acids to its caloric value. Comparisons to other meat sources have also shown that Bison has a greater concentration of iron as well as some of the essential fatty acids necessary for human well being. In a small bowl combine paprika, salt, garlic powder, oregano, thyme, black pepper, onion powder, and cayenne pepper. Stir in oil until well combined. Set aside. Trim fat from roast if necessary. Spread oil mixture over surface of meat. 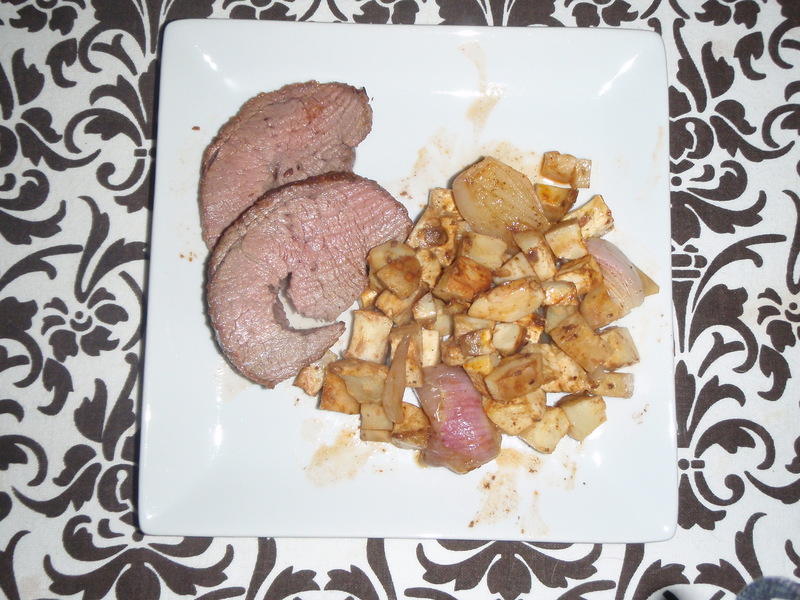 Place meat in a shallow roasting pan with celery root and shalots. 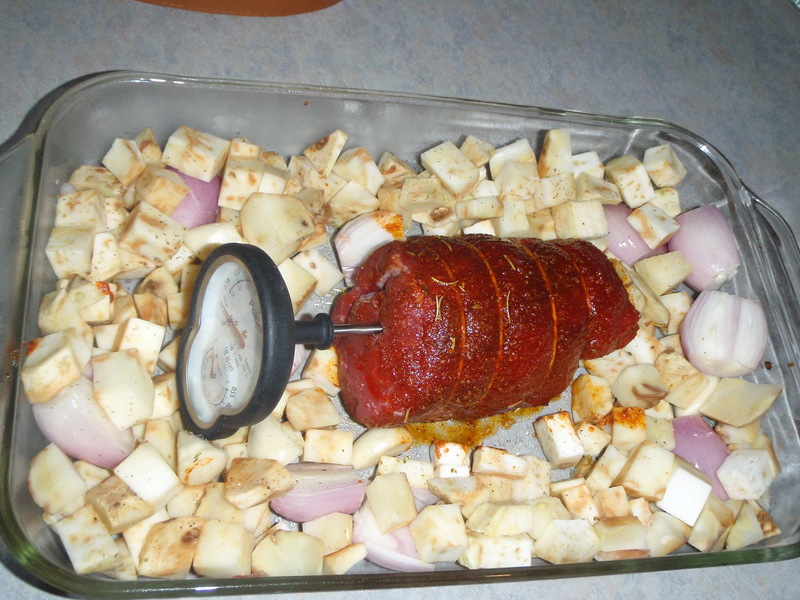 Insert an oven-going meat thermometer into center of meat. Roast in a 375 degree F. oven for 15 minutes. Reduce oven temperature to 300 degrees F. Roast 50-60 minutes more or until meat thermometer registers 140 degrees F.
Remove and cover roast tightly with foil and let stand in pan for 15 minutes. The temperature of the meat after standing should be 145 degrees F. (medium rare).